What a great book! No real plot to follow, just the journey of two brothers; Carter and Ralph Stanley; who heard some music on an old battery powered Philco radio when they were young; and then set out to chase that dream. Carter would pass away in 1966, never having hit the “big time” but doing what he loved best. Ralph would take his brothers memory, as well as their music, on to worldwide acclaim and a Grammy Award at the age of 75 for his rendition of the old gospel hymn “O, Death” in the film “O Brother, Where Art Thou?” It was the first time a man his age had won the award, and also the first time the award was given for an acapella number. The book is written with the aid of Eddie Dean who serves to organize the thoughts of the author. 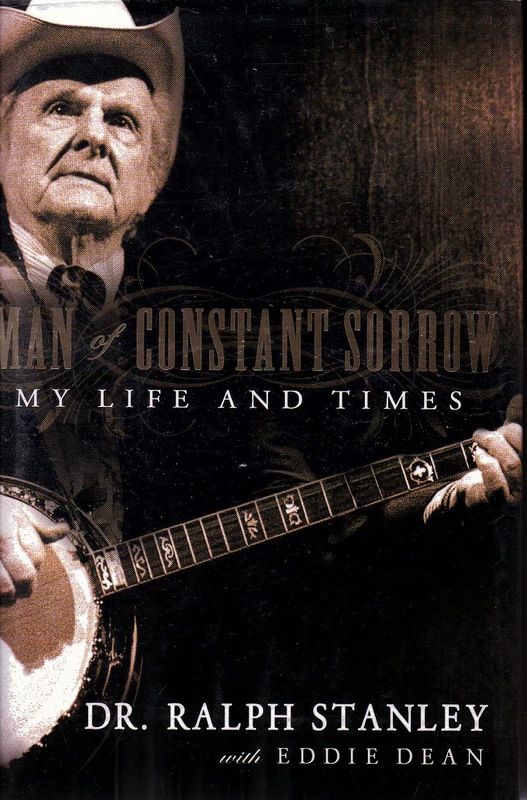 He does little to interfere with Ralph Stanley as he tells his story. The cadence, the nuance; all that is Mr. Stanley in a live interview, is captured well within these pages. The whole story is right here. And what a story it is! Beginning in Smith Ridge, with a mother who has known more than her share of sorrow, Ralph Stanley takes you on a trip through the early years of his life, painting a wonderful picture of two inseparable brothers; himself and Carter who was just a few years older. The two had a love for music and aside from a short span of time during the Second World War, they would spend their entire lives together on the road until Carter passed away in 1965. Carter and Ralph were close but they were also different. One of those differences concerned alcohol, which Carter used more and more as the years passed. What started out as a shot before going on stage became a lifelong indulgence that never stopped; like an urge which only grew more and more demanding; until it consumed his soul. It was a principal component of what finally killed him. The early years on the road, working for next to nothing; the long stretches of wondering if it was all worth the struggle; and so much of what it takes to really become a musician in more than just name, are all chronicled here by Mr. Stanley in an energetic and breezy style which will remind you of listening to the stories of some old guy down at the corner store. Fans of Keith Whitley and Ricky Skaggs will find much to enjoy here, as the two teenagers were a part of The Stanley Brothers before they made it on their own. The author holds much affection for these two men. They came to him as boys, but by the time they left they were full time musicians who had earned the right to call themselves Clinch Mountain Boys, which was the name of Ralph and Carter Stanley’s band. If you have read Ricky Skaggs memoirs then some of this will be familiar, but even better for hearing it from Mr. Stanley’s point of view. Bob Dylan is in the book, which surprised me. The author holds him in high regard as a troubadour who has stuck to his guns on the music he sings and plays. He even likes Dylan’s version of “Man of Constant Sorrow”. I have to admit that I can’t stand that recording. It was an early one for Dylan, during the Greenwich Village days. In short, there is nothing about this book that you will not enjoy. Even if you are not a fan of the Stanley’s this book has a lot to offer. The author’s insights into the entertainment industry of the past are illuminating and insightful; in that they offer a unique comparison to the industry as we know it today. This was a thoroughly delightful read.